The time is right for Governor Branstad to propose a minimum wage increase. It’s the right thing to do, and the ball is in his court. Election Night 2014 — the hours that established why Governor Terry Branstad should push for an increase in the state minimum wage. At first blush, this might not seem obvious. It was a big Republican night, and support of the minimum wage is not a marquee issue for Republicans. On Election Night, a minimum-wage critic won the U.S. Senate seat of one of the nation’s most high-profile and ardent supporters of a minimum-wage increase, Iowa’s Tom Harkin, and Republicans took control of that chamber. Over in the House, Republicans flipped one seat and now hold three of Iowa’s four, along with a historically overwhelming majority that makes the minimum-wage increase sought by President Obama highly unlikely. This turns the focus to the Iowa Statehouse, where the power structure remains effectively the same: Republican governor, narrowly Democratic Senate, slightly stronger Republican majority in the House. With little change in Des Moines, why would passage be more likely now? For one thing, we have gone one more year without an increase. It has been almost seven years now at $7.25; it is only a matter of time — and we may be there — when Iowa reaches a tipping point where inertia succumbs to an increase in the minimum wage. For another, the near-certainty that it will not pass in Washington erodes pleas to wait for the feds. Recall that Iowa stopped waiting in 2007, passing the $7.25 wage that took effect in January 2008, almost 19 months ahead of the federal $7.25. Finally, the tipping point noted above may be signaled in state referendum victories on Election Night for minimum-wage forces in two neighboring “red” states — Nebraska and South Dakota — indicating the time is right politically. 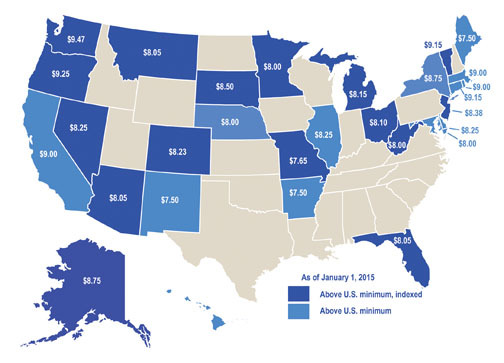 Of the states bordering Iowa, only Wisconsin is stuck with us at $7.25. An increase would be popular in Iowa. A recent poll showed 53 percent support for an increase to $10.10 an hour. [i] No politician in either party will be disadvantaged in 2016 having supported a minimum wage increase. A boost to local and state economies as families have more to spend. A fiscal benefit to the state as less is needed to support extremely low-income working families. More resources to support stronger work-support programs to point low-wage workers on a path to the middle class. For all of these reasons, the time is right for Governor Branstad to move ahead. It’s the right thing to do, and the ball is in his court. Next Next post: Where have you gone, Henry A. Wallace?